For the biological nomenclature, see Grasshopper. In zoology, locust is the common name for any member of several species of short-horned grasshoppers of the family Acrididae that are characterized by having a swarming (gregarious) phase in addition to a solitary phase. The term locust is not a formal taxonomic rank. They do not belong to a particular genus or subfamily, but are those species of grasshoppers that exhibit behavioral, morphological, and physiological changes from a solitary phase to a migratory phase (Grzimek et al. 2004). For example, the desert locust (Schistocerca gregaria) of Africa and Asia are normally solitary, but the spring rains trigger a behavior transformation that can result in single swarms larger than any other single congregation of organisms on Earth, ranging from 100,000 to 10 billion insects (Grzimek et al. 2004). One swarm in 1794 once spread over 5,000 square kilometers (almost 2,000 square miles) (Grzimek et al. 2004). Locusts have provided a key ecological role in food chains, helping to convert plant biomass to a form usable by carnivores. They also add to the wonder of nature for humans, and have been featured in prominent works of religion and literature, such as the eight plagues mentioned in the Bible and being referenced Plato's Phaedrus. On the other hand, locusts historically have been a serious problem for human agriculture, particularly monoculture. However, human creativity has devised many ways to reduce this threat and today the problem of such swarms is significantly reduced. 4 Related uses of the word "locust"
Locusts are a type of grasshopper—long and slender insects belonging to the order Orthoptera and typically with long, strong hind limbs for leaping and powerful mouthparts for chewing. 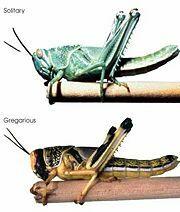 Although the term grasshopper is imprecisely defined, it most commonly refers to members of two Orthopteran families: the family Acrididae ("short-horned grasshoppers") of the suborder Caelifera and the family Tettigoniidae ("long-horned grasshoppers") of the suborder Ensifera. The Tettigoniidae (long-horned grasshoppers) are typified by antennae longer than the body, while the Acrididae (short-horned grasshoppers) have antennae shorter than the body. At times, members of the entire suborder Caelifera as a group are called short-horned grasshoppers. Locusts are migratory members of the family Acrididae. Acrididae is the largest family in Caelifera. The family is characterized by the short, thickened antennae and relatively unmodified anatomy. They are often visually more striking than other Caelifera, due to the adults' wings and legs, which are well developed and may be brightly colored. Auditory organs are on the abdomen, unlike on the forelegs of the family Tettigoniidae. Locusts are species that can breed rapidly under suitable conditions and subsequently become gregarious and migratory. They form bands as nymphs and swarms as adults—both of which can travel great distances, rapidly stripping fields and greatly damaging crops. Though the female and the male look alike, they can be distinguished by looking at the end of their abdomen. The male has a boat-shaped tip while the female has two serrated valves that can be either apart or kept together. These valves aid in the digging of the hole in which an egg pod is deposited. Research at Cambridge University has identified the swarming behavior in the desert locust, Schistocerca gregaria, as a response to overcrowding. The trigger is increased tactile stimulation of the hind legs. Several contacts per minute over a four–hour period are sufficient to induce transformation to the swarming variety (Rogers et al. 2003). The extinction of the Rocky Mountain locust, Melanoplus spretus, has been a source of puzzlement. Recent research suggests that the breeding grounds of this insect, in the valleys of the Rocky Mountains, came under sustained agriculture, destroying the underground eggs of the locust (Ryckman 1999). The farming of those valleys was a response to the large influx of gold miners. Desert locust (Schistocerca gregaria), probably the most important in terms of its very wide distribution (North Africa, Middle East, and Indian subcontinent) and its ability to migrate very widely. Rocky Mountain locust (Melanoplus spretus) in North America had some of the largest recorded swarms, but mysteriously died out in the late 19th century. Grasshoppers have traditionally been agricultural pests. Locusts outbreaks have been particularly noteworthy. Locusts can form very large swarms that can migrate in a more or less coordinated way and cause massive damage to crops. Important locust species include Schistocerca gregaria and Locusta migratoria in Africa and the Middle East, and Schistocerca piceifrons in tropical Mexico and Central America. Outbreaks have been much less serious with the advent of insecticides. Some orthopterans have been facing extinction, largely due to habitat loss. In the Bible, a swarm of locusts comprised the eighth plague in the story of the plagues of Egypt. In the Book of Revelation, locusts with scorpion tails and human faces are to torment unbelievers for five months when the fifth trumpet sounds. One Old Testament book, Joel, is written in the context of a recent locust plague. Interestingly, the locusts are described in four different ways: "swarming locusts, cutting locusts, hopping locusts, and destroying locusts." Although these were identified by the old Authorized Version as four different creatures, modern translations identify them as four kinds of locusts. This fits with the many molts (called instars) through which grasshoppers go. For example, the "hopper" probably denotes the nymph stage (the first instar), the wings are not developed, and the nymph hops about. In Plato's Phaedrus, the main protagonist Socrates remarks that locusts were once human. When the Muses first brought song into the world, the beauty so captivated some people that they forgot to eat and drink until they died. The Muses turned those unfortunate souls into locusts—singing their entire lives. In her novel On the Banks of Plum Creek Laura Ingalls Wilder writes of a "glittering cloud" of locusts so large it blocked out the sun as it approached. The swarm descended upon her family's farm near Walnut Grove, Minnesota, destroying a year's wheat crop, and stripping the prairie bare of all vegetation. Locusts are used as models in many fields of biology, especially in the field of olfactory, visual, and locomotor neurophysiology. It is one of the organisms for which scientists have obtained detailed data on information processing in the olfactory pathway of organisms. It is suitable for the above purposes because of the robustness of the preparation for electrophysiological experiments and ease of growing them. Related uses of the word "locust"
The words "lobster" and "locust" are both derived from the Vulgar Latin locusta, which was originally used to refer to various types of crustaceans and insects. Spanish has mostly preserved the original Latin usage, since the cognate term langosta can be used to refer both to a variety of lobster-like crustaceans and to the swarming grasshopper, while semantic confusion is avoided by employing qualifiers such as de tierra (of the land) when referring to grasshoppers, de mar and de rio (of the sea/of the river) when referring to lobsters and crayfish respectively. In Mexican Spanish, this confusion does not arise since the Nahuatl derived word chapulín is used instead. French presents an inverse case: during the XVI century the word sauterelle (literally "little hopper") could mean either grasshopper or lobster (sauterelle de mer) (Rondelet 1558). In contemporary French usage, langouste is used almost exclusively to refer to the crustacean (two insect exceptions being the langouste de désert and the langouste de Provence) (Bernier 2006). In certain regional varieties of English, "locust" can refer to the large swarming grasshopper, the cicada (which may also swarm), and more rarely to the praying mantis ("praying locust"). The use of "locust" in English as a synonym for "lobster" has no grounding in anglophone tradition, and most modern instances of its use are usually calques of foreign expressions—, for example, "sea locust" as mistranslation of langouste de mer (Fodor 2007). There are, however, various species of crustaceans whose regional names include the word "locust." Thenus orientalis, for example, is sometimes referred to as the Flathead locust lobster (its French name, Cigale raquette, literally "raquet cicada," is yet another instance of the locust-cicada-lobster nomenclatural connection). Similarly, certain types of amphibians and birds are sometimes called "false locusts" in imitation of the Greek pseud(o)acris, a scientific name sometimes given to a species because of its perceived cricket-like chirping. Bernier, C. 2006. La Saga des Magiciennes dentelées. Ecologistes de l’Euzière. Retrieved October 5, 2007. Browne, T. 1672. Of the erectness of man. Pseudodoxia Epidemica Fourth Book, Chapter 1. Retrieved October 5, 2007. Browne, T. 1672. On the Picture of a Grashopper. Pseudodoxia Epidemica Fifth Book, Chapter 3. Retrieved October 5, 2007. Browne 1684. An answer to certain queries relating to fishes, birds, and insects. Miscellany Tracts Retrieved October 5, 2007. Capinera, J. L., R. D. Scott, and T. J. Walker. 2006. Field Guide to Grasshoppers, Katydids, and Crickets of the United States. Cornell University Press. ISBN 0801489482. Fodor's Travel. 2007. Marseille Dining. Fodor's Travel Guide. Retrieved October 5, 2007. Rogers, S. M., T. Matheson, E. Despland, T. Dodgson, M. Burrows, and S. J. Simpson. 2003. Mechanosensory-induced behavioural gregarization in the desert locust Schistocerca gregaria. J Exp Biol 206(Pt 22): 3991-4002. Rondelet, G. 1558. Histoire Entière des Poissons. SICD Universities of Strasbourg. Retrieved October 5, 2007. Ryckman, L. L. 1999. The great locust mystery. Rocky Mountain News. Retrieved May 20, 2007. Schlebecker, J. T. 1953. Grasshoppers in American agricultural history. Agricultural History 27: 85-93. This page was last modified on 2 April 2008, at 11:19.